The XBee library, written by Andrew Rapp, is for communicating with XBee wireless modules in API mode. The simplest way to use XBee with Teensy is this adaptor board. XBee modules need to be configured with the X-CTU software. 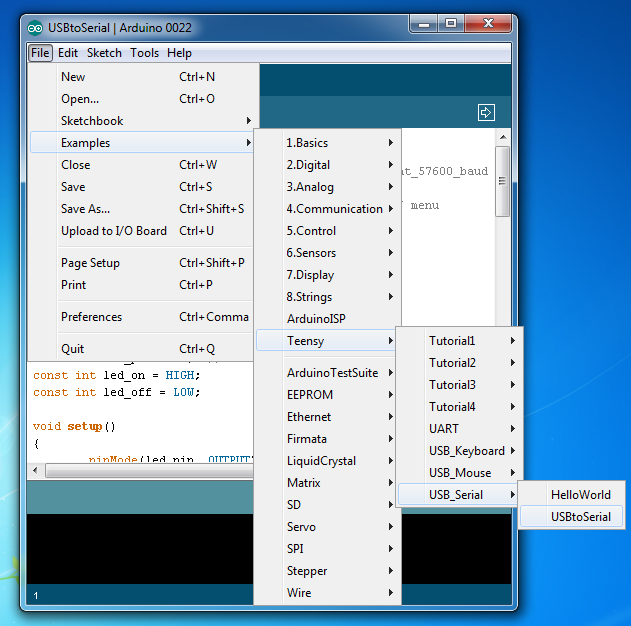 Before running X-CTU, upload the USBtoSerial example, found in File > Examples > Teensy > USB_Serial > USBtoSerial. Tools > USB Type must be set to Serial before upload to Teensy. 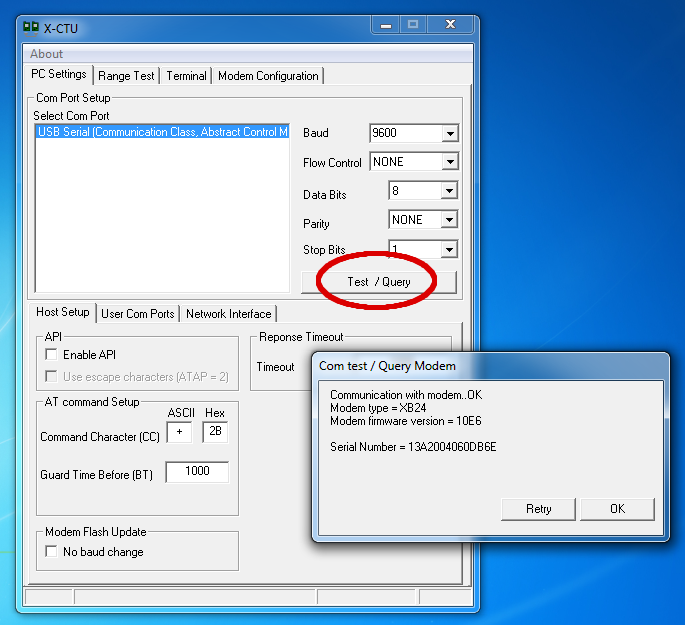 When you run X-CTU, select the "USB Serial" port which is Teensy (running the USBtoSerial sketch), and then click "Test / Query". If "Test / Query" fails, check your connections and power to XBee. 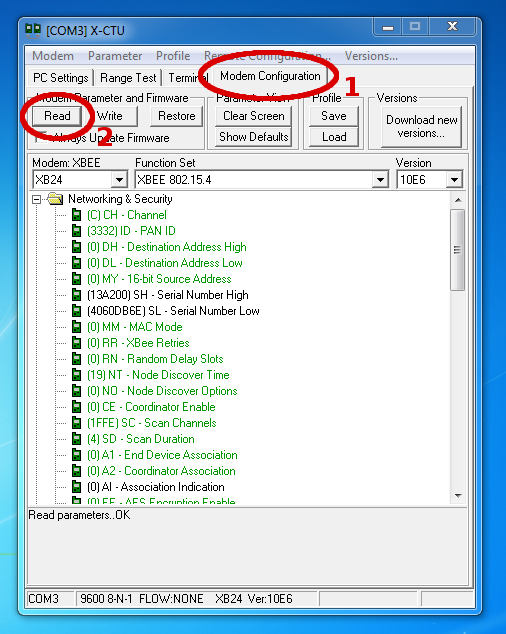 To access XBee's settings, click the "Modem Configuration" tab, and then click "Read". From here, you can configure your XBee for API mode. 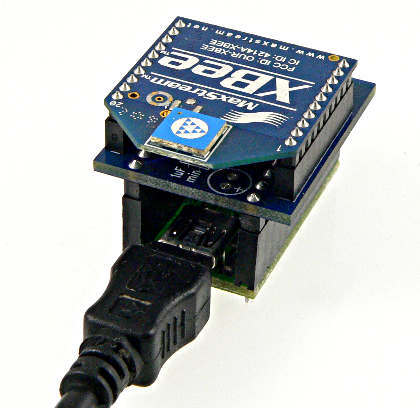 The XBee examples use the NewSoftSerial library because the Arduino Serial port is need to talk to XBee. On Arduino, you would need to connect another USB-Serial converter to the NewSoftSerial pins. On Teensy there is no need for NewSoftSerial and an extra USB-Serial converter. You can use the USB port, because XBee uses the completely separate Uart pins. To make the examples work easily, remove the NewSoftSerial object, and add a #define to use Serial in place of "nss". With Teensy, XBee is normally used with Serial1 on Teensy 2.0 and Teensy++ 2.0, or Serial3 on Teensy 3.0. The setSerial() function should use Serial1, Serial2 or Serial3. TODO: help wanted... to write the rest of this page with actual usage examples. Here is the main XBee library page.